Open /private/etc/hosts and add a line at the bottom of file for each host you intend to create. Each line should begin with 127.0.0.1followed by a space and then the name of the host. If the second line is commented out (hash tag to start the line, as above), remove the hash tag. This instructs apache to load the configuration file for virtual hosts, which now needs editing. 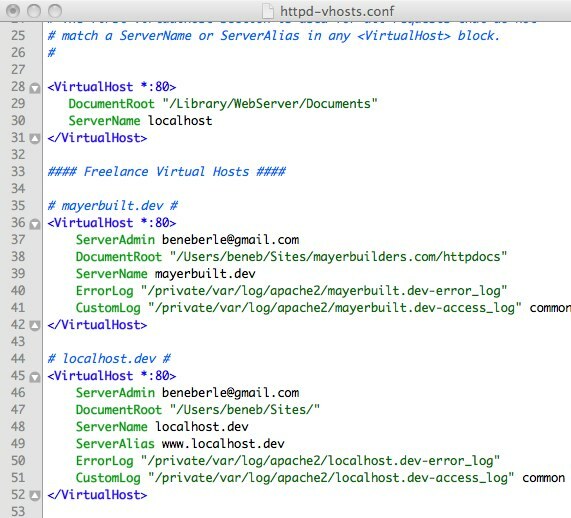 # match a ServerName or ServerAlias in any &lt;VirtualHost&gt; block. 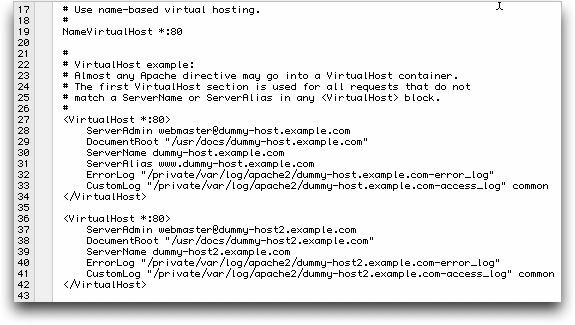 Lines 27–42 are examples of virtual host definitions. You need to replace these with your own definitions. When you enable virtual hosting, Apache disables the main server root, so the first definition needs to reproduce it. That should do it, unless, like me, you browsed to your site and encountered nasty 404 errors when trying to navigate around. I had a hunch my .htaccess file was being ignored, and sure enough, after some basic tests, I discovered that while mod_rewrite was working for files served from the default /Library/WebServer/Documents folder, it was not for the newly created virtual hosts. 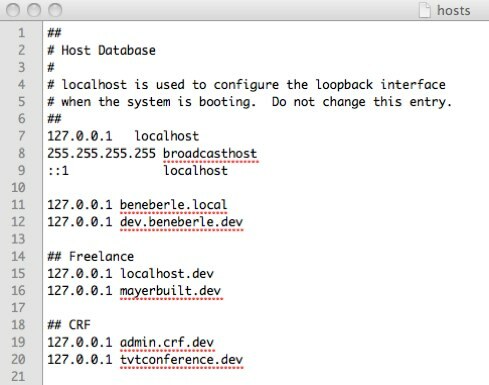 When using the snippet above, change “beneb” to your home directory. The main thing here is AllowOverride. AllowOverride controls what directives may be placed in .htaccess files. Set this to “All”. This tells apache that it’s OK to allow rewriting URLs from files in the /Users/beneb/Sites directory.